David Hockney (born 1937) is one of the most influential British artists of the twentieth century. A painter, printmaker, photographer, and stage designer, Hockney has had a growing impact since his emergence from the British Pop Art movement of the 1960s. His work tests the boundaries of Modernism by shifting between abstraction and realism—often within a single piece. Hockney’s mastery of color and supremely balanced compositions respond to the light and landscape of Southern California, where he has lived and worked extensively since the 1960s. 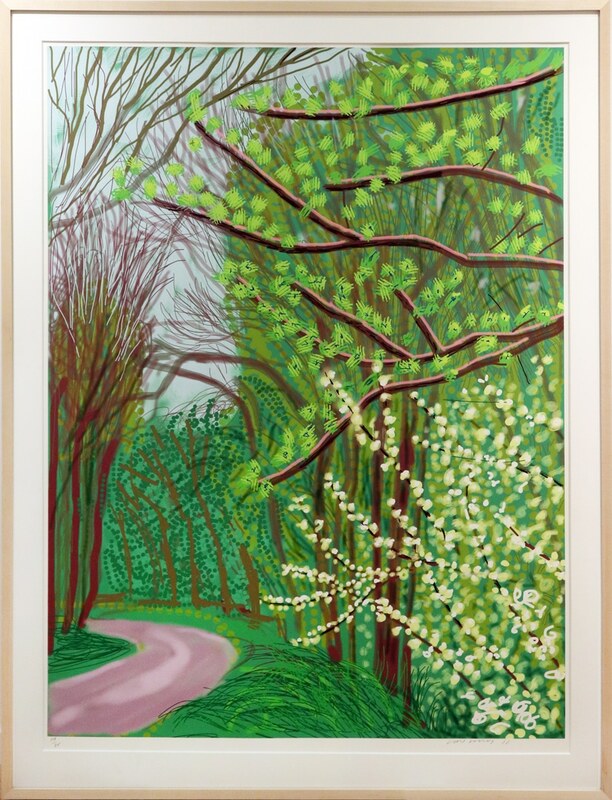 Yet Hockney’s body of work also suggests extensive travel and a sustained concern for his native northern England. Hockney’s complex oeuvre demonstrates his command of a wide range of media and styles, not for their own sake but always to further his pictorial dexterity. David Hockney was born in Bradford, England, in 1937. At the age of 16 he began studying at the Bradford School of Art. Six years later he moved to London to study at the Royal College of Art. Hockney gained recognition at an early age, receiving a gold medal from the Royal College of Art for his year and a solo exhibition at the Bond Street gallery of John Kasmin by age twenty-six. This early work gained him a reputation as a leader in the British Pop Art movement, though he struggled to situate himself within the narrow categories provided by modernism. Hockney visited the United States for the first time in 1961 and, after some travel, moved to Los Angeles in 1964. There he created his first paintings of the effects of light and water in Southern California’s iconic swimming pools. Hockney also briefly taught at the University of Iowa and soon after, the University of Colorado, Boulder. Then, returning to California by 1967, he taught at University of California, Los Angeles and University of California, Berkeley. In 1968 he returned to the United Kingdom, settling in London. This period marked a return to more traditional subject matter and a series of intimate portraits. In 1970, London’s Whitechapel Gallery organized a traveling retrospective of Hockney’s works. Hockney continued to travel internationally, first to Japan and then to Paris where he settled in 1973. During this decade he created multiple theatrical sets and costumes. By 1978 Hockney returned to Los Angeles, establishing a permanent base. During the 1980s, Hockney worked in a variety of disciplines. In 1980–81 he designed the sets and costumes for major productions at the Metropolitan Opera including The Rite of Spring, Le Rossignol, and Oediups Rex. In 1985 he designed the cover and a large portion of French Vogue. Hockney’s travels to China in the early ‘80s led him to produce the film A Day on the Grand Canal with the Emperor of China or Surface is Illusion But so is Depth in 1988. The 1990s were a highly prolific decade for Hockney with extensive travel and significant work involving paintings, prints, photographs, written works, discussions, theatrical set designs, and exhibitions. Hockney exhibited at the Venice Biennial in 1995. He had numerous traveling retrospectives, including an exhibition at the Los Angeles County Museum of Art in 1996. In 1999 he installed nine paintings from his series on the Grand Canyon at the Royal Academy of Arts in London. 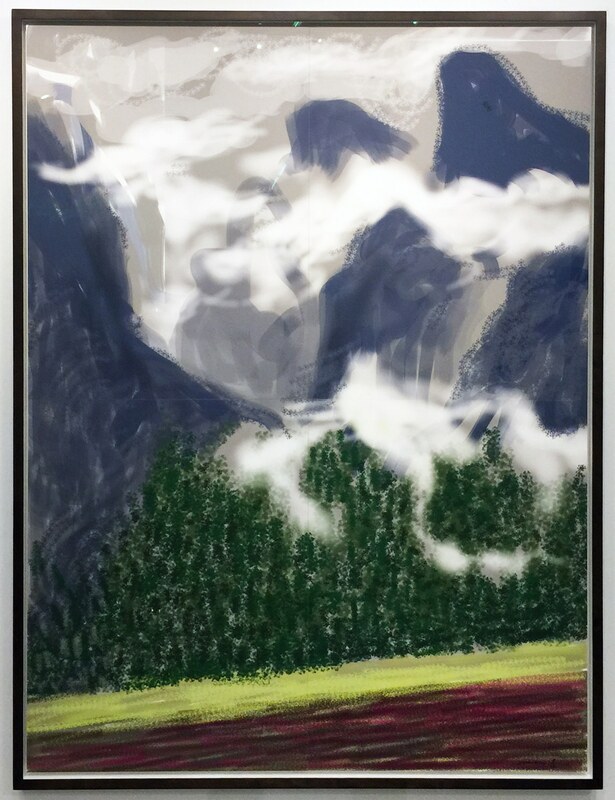 Hockney continues to exhibit at major international venues and recently incorporated digital artwork into his ever-expanding repertoire of media and styles.